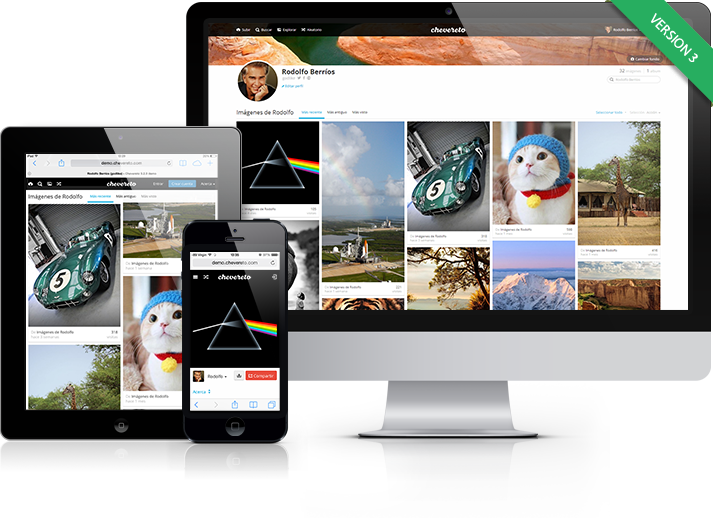 A fully responsive image sharing experience with drag-and-drop uploader, multi-server support, categories, user accounts, private albums and more. You will just love Chevereto! Chevereto comes with a gorgeous fully responsive user interface with a universal drag-and-drop uploader, an astonishing content manager, and a user interface that you’ll fall absolutely in love with for its gorgeous look and feel. Try our Chevereto demo and be amazed! Easily provide image uploading to any website via the upload plugin which features seamless support for the most popular forum software packages such as XenForo, phpBB, vBulletin, SMF, Discourse, IP.Board and more. Easily configure as many homepage cover images as you want within just a few clicks from the dashboard panel. The cherry on top is that Chevereto's homepage animation looks stunning and it definitely catches the eye. A unique uploader that features image previews, drag-and-drop, clipboard uploading and simultaneous uploads. It also includes image resizing, watermarks, removal of Exif data, setting of expiration times, NSFW flags, private uploading and more. It also has a fast image viewer with pre-loader functionality to show images much more rapidly. Chevereto includes image Likes, a Follow system, and a superb notification system. It also comes with support for account signup using Facebook, Twitter, Google and VK right out the box. No additional plugins are needed. Just paste the API keys and voila! Chevereto installs quickly and is highly configurable. You can install it using our web installer and it includes one-click update system, so you can spend your time making your website stand out and get quality content. Chevereto do the rest. Every license comes with software updates, meaning that once you buy Chevereto, you don't need to pay extra every year to keep getting access to updates and software support. You can add unlimited categories and set their name, URL and description. 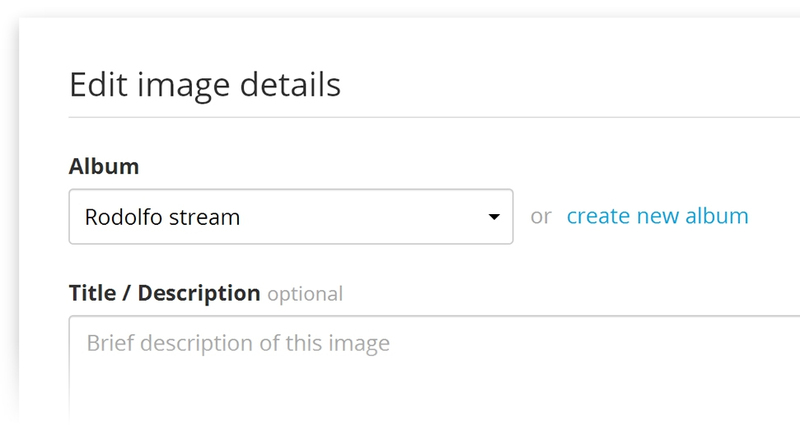 You can also set the title and description for each image uploaded or album created. Chevereto allows you to set the right context for your content which will please your visitors and allow search engines to crawl your website with the greatest of ease. A system-wide content manager allows controlling the content anywhere directly from the front end, allowing you to drag select items and perform bulk actions for a selection of items like edit, delete, flag content, create albums and more. You can also bulk import content (images, users and albums) directly from a filesystem path. Chevereto comes bundled with 28 languages and it works brilliantly to select the ideal language for your users automatically, as well as being ready for any language you may wish to add. Check out our Chevereto translation center to see all the available translations. Chevereto also supports translation overrides so you can highly customize any single phrase being displayed without having to alter any theme files at all. Multiple updates are released each month with all-new features, patches, bug-fixes and new translations. Check our releases page for a complete overview of this so you can track exactly what we do. Chevereto has more than 10 solid years on the market and is the most popular image hosting in the world, so you can rely on us to keep everything up-to-date. From global privacy settings to single-content privacy settings, Chevereto includes all the tools to fit the privacy of images and albums to your needs. You can set up either a public or private image hosting website, or create a personal image hosting site for only you to use. It also includes support for private profiles and password-protected albums. All the stats and tools that you need to run your website are all together in one central and extensive admin dashboard where you can manage images, users, settings and anything else. The dashboard also has all of the important system information and usage statistics right in one place, so you don’t need to dig around in your server configuration files to get quick information about your system. Make your website insanely fast and reliable by distributing the image uploads among as many external storage servers as you wish to add. It includes support for Amazon S3, Azure, Alibaba, Google Cloud, OpenStack, Backblaze and FTP/SFTP, so you have plenty of options to make it happen and within your own budget and needs. Chevereto comes with 19 ad spaces that will fit gorgeously in the default theme. Just paste the banner codes and you’re done. Start earning money right away without messing with template files or anything else. The system allows both SFW and NSFW banners to be displayed, depending on the content being displayed, so ads will always be in the right context. Chevereto is built on top of a custom-made framework called G\ Library. This foundation allows for easy improvement with every release without compromising performance. All code is 100% visible with no encryption at all, so you can customize it to fit even your most ambitious needs. The system is lightning fast – dynamic page rendering takes an average of just 0.07 seconds to load. Chevereto supports PHP 7, so you can get incredible speed and reliable performance. Chevereto also includes support for use of a CDN and multiple storage servers, so your system can keep scaling without hassles. Chevereto has a large community of clients and fans that help us to make Chevereto better every day. We are always adding new features, all thanks to user feedback. If there is something missing at this time, be sure that it will be added in the future. This is a resume of almost all that Chevereto can do. We’ve made a system that seeks a better image hosting experience in every release so the following list changes every month due to our highly active development and continuous core improvements. Bulk flag content, assign category, delete, move to album, etc. Enable or disable features like user registration, image upload (guest/registered), random button, explore, search, etc. User signup methods, email confirmation, etc. Built-in classes for upload, handling, listing, etc. Chevereto has a lot of features and new things to come which are highly focused on community feedback. Feel free to join our forum and share your ideas and needs to make Chevereto even better. Check our releases for a complete record of changes and improvements over time. PHP 5.6.0+ (PDO, PDO_MYSQL, GD Library, cURL) and MySQL 5.0+. Check out our hosting section to get Chevereto auto-installed with one year of hosting starting at just $47.40.